Often growing in colonies, ashy sunflower is relatively short compared to other sunflowers. Ashy sunflower is a perennial sunflower usually appearing in colonies. Flowerheads are few, often a lemony yellow, to 3½ inches wide. The overlapping bracts beneath the flowerhead are many, narrow, and thin. July–October. Leaves sessile, stiff, densely gray-hairy, broadly ovate, opposite, with inconspicuous teeth. Similar species: Of the 6 most widely distributed sunflowers in Missouri, 2 others have leaves with very short petioles. Stiff-haired sunflower (H. hirsutus) has fairly uniform lanceolate leaves, almost all opposite, with small teeth. The rough hairs make it feel like sandpaper. The flowerheads are all yellow; the rays often point upward. Prairie sunflower (H. pauciflorus) grows to 7 feet tall and has toothless, rough-hairy, mostly broadly lanceolate leaves that are green (not grayish). The disk florets are purple, the flowerheads few, but large. Height: to 4 feet, but usually much shorter. The few flowerheads of ashy sunflower have 17–30 ray florets, which are often a lemony yellow. The overlapping bracts beneath the flowerhead of ashy sunflower are many, narrow, and covered with hairs. Ashy sunflower is a native perennial wildflower that usually grows in colonies. The leaves of ashy sunflower are opposite, sessile, broadly ovate, stiff, and densely gray-hairy, with inconspicuous teeth. Colonies of ashy sunflowers make a striking late summer display in our native tallgrass prairies. Sunflowers feed a variety of insects with nectar and pollen, and their seeds feed finches, mice, and more. Primarily occurs in prairies, but also roadsides and fields: Upland prairies and glades, pastures, old fields, fencerows, margins of ditches, railroads, and roadsides. 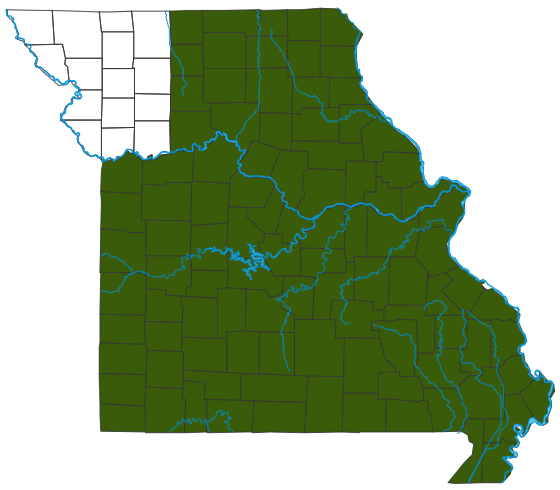 Common in the Unglaciated Plains Division, thus mostly in the southern half of the state, scattered elsewhere. Mostly absent from northwestern Missouri. Tallgrass prairies have a special charm that is not apparent when you speed by them on a highway. But if you visit a prairie regularly, and watch plants like ashy sunflower grow and develop over the course of a year, you learn to love even their dried remains that stand starkly through the winter. Sunflowers provide nectar and pollen to a great variety of insects, plus a hunting ground for spiders, assassin bugs, and other predators of the many insects attracted to the nectar and pollen. When the flowers are spent, birds and mammals, including finches and rodents, relish the sunflower seeds.